They finally put it in writing! Discussion in 'Massachusetts Laws' started by Glasgow Grin, Mar 31, 2017. A friend has been trying to sell a pre-Maura AR-15, but buyers are understandably hesitant, fearing prosecution. Thus far, nobody has been able to get the OK in writing. Well, here it is! And right there boys and girls, the Gary Klein Loophole was born. Obtained by whom prior to 7/20? And transferred to whom? Does "in a private sale" necessarily mean in state? 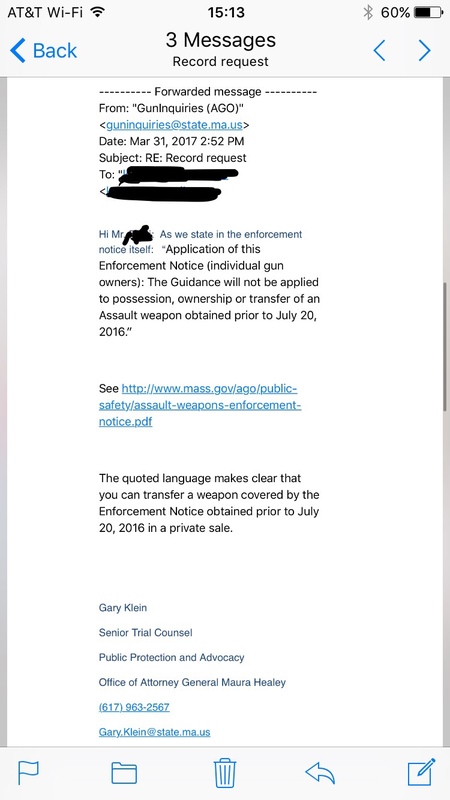 In other words, is any gun that was acquired prior to 7/20 freely transferrable in MA, or can only the person who obtained it prior to 7/20 possess it? The AGO isn't stupid. They are very cognizant of a potential constitutional takings issue if they were to tell people that they could no longer possess or transfer their property. Had the AGO informed this person that it was illegal for them to transfer their AR, it would have exposed them to a possible law suit. The AG's 'enforcement notice' was all about intimidating dealers into shutting off the the supply of firearms that the AG thinks we shouldn't have. shiprec13 and Jason Flare like this. Seeing as you can only legally conduct private transfers between two MA residents, this email and the guidance on the state website seem to logically imply that both the buyer and seller are legally in the clear. However, logic has been thrown out the window with the AGO, so I wouldn't want to test it out without a more explicit answer. Did you thank him for his "opinion?" Maybe he should have referred you to the law that backs up what he said? Oh that's right, there is none. It is just a date that "someone" picked out of thin air. So, let's say a guy transfers his AR today, March 31 2017, that the guy had owned before July 20th of 2016. This is ok with Maura and her crew. So, the new owner has now purchased this AR after July 20th 2016 and he does not fall under the special dispensation clause. He cannot transfer his AR in the future. Am I making it clear to you? He's stuck with a rifle he can't sell or transfer in MA. In order for the dispensation to work properly the rifle should have a "bought date" attached to it to show it was legally owned in MA. This "bought date" should follow the rifle to any future owner and allow legal transfers in MA forever. Neither of the emails helps. The original question might make it clear depending on exactly what was asked. The email says "you" can transfer, if we assume the original question was "I have an AR which I obtained prior to 7/20, can I sell it?" Then the letter confirms you can sell (transfer) it but it doesn't say that it can be sold (transferred) to another MA resident. On the other hand if the original question was: "I own an AR which I obtained prior to 7/20. I would like to sell it to another MA resident. Can I legally transfer my AR to another MA resident, who is properly licensed, in a face to face transaction, properly recorded on an eFA10?" And make sure you print out the complete email exchange with the header information. This would be necessary to verify the source of the email. In your interpretation wouldn't the buyer's possession after 7/20 make it illegal for him to buy? The seller can sell but the buyer is not exempt because he is taking possession after 7/20. The law sounds like it is intended to be similar to the AWB grandfather clause using the registration date rather than manufacture date. The message in the OP says, "Obtained," it does not say by whom. So, I'd say that as long as someone obtained it, it's legit. The eFA-10 records that the PRM has, should be a "Bought on date," making it legal. It would seem to me that, since the interpretation cites obtained, and a date, that these are the only salient points. Maybe. The message says prior to 7/20/16. If anyone bought an AR on 7/20/16, then they are left with Maura's threat of changing her mind, making anything bought on 7/20/16 illegal. Oh wait, anything after 1994 or is it 1998, is also subject to being illegal if Maura wakes up on the wrong side of the bed. Yeah, clear as mud. The Efa-10 use as a "bought on date" is problematic as well. For example, the Matrix group buy. I "bought" the lower in feb(?). I acquired it 5/12/16 when Alex did the 4473. I then reg'd it 7/21. This reminds me of The Song That Never Ends. It just goes on and on and on. What the **** is Guidance anyway? Some new Progressive, extra-legislative, extra-judicial code that peons of the Tyrannical State are subject to? That about sums it up. But due to limted funds (unlike maura's) I must tread lightly. Remember in massASSachusetts unless you make the laws you are a peon and peasant in their eyes. The guidance that says bought prior to 7/20/16, does that mean bought ONLY in MA? What if I bought an AR in Maine before that date, and then this year convert it to be MA compliant and bring it into the state? No transfer or purchase involved since I bought it in Maine as a Maine resident at the time (it currently lives at a family members house in ME). Well how about this.......do you want someone to give you a fish or would you rather learn to fish? If you want the fish then bring it in and EFA-10 it. Len-2A Training and CAR like this. Also keep in mind this is his guidance on a "notice" and not a law. Tomorrow morning Healey could edit out that whole section if she felt like it since it's not subject to any legislative process. I'm going to file this letter under "absolutely irrelevant." drgrant and Len-2A Training like this. A representation by a state LEO that you can do something without violating state law has teeth, and actually more than a claim you cannot do something. Read up on entrapment by estoppel. Note that this defense does not cross the state/federal line - a representation by a state official is not a defense against a federal charge and vice-versa. Actually our rabid AG stated that any AR/AK obtained after the 10/21/1998 law was illegal to possess/buy/sell but she wouldn't prosecute (now). No way that she'd prosecute because any judge with 3 active brain cells, given competent counsel would collapse her entire house of cards. daekken and TLB like this.